Evening snorkeling in Silfra at Þingvellir National Park. We went on the “Under the Midnight Sun” evening snorkeling tour and along with our guide, we were the only people in the river so we had the entire area to ourselves. The water in Silfra is a stunningly bright blue and some of the clearest water on earth. Crossing a single lane bridge while driving along Route 1 in south Iceland. In 1996, following a volcano eruption, a flood destroyed bridges and Route 1 in southern Iceland. This is a memorial created from twisted bridge girders that were destroyed in the flood. Rock formation spotted in a field while road tripping the south coast of Iceland. 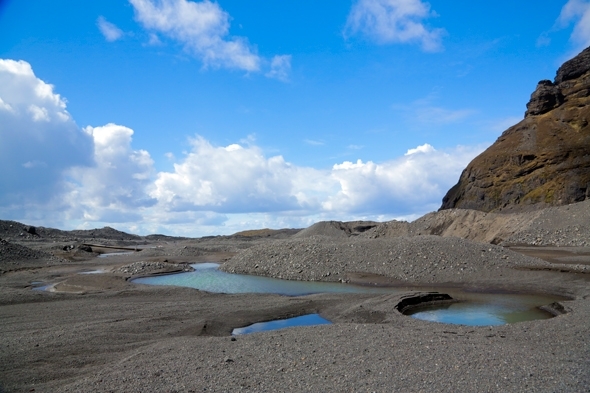 Near the entrance of Vatnajökull National Park with a glacier in the background. There was a dust storm in this lava field near Route 1 when we were driving by. The ever changing landscape in Iceland always makes for interesting scenery when driving Route 1. Driving on a rainy day out to the Drumbó Base Camp for our White Water Canoeing trip. Relaxing in a stretch of calm water of the Hvítá River while white water canoeing. Cliff jumping into the Hvítá River during our white water canoeing trip. Micah and I were too cold to jump into the freezing water, but others from our group were more brave. Boat that gives tours of Jökulsárlón, the glacier lagoon. Ice at the glacial lagoon, Jökulsárlón. Walking along the black sand beach where the icebergs from Jökulsárlón float out to the ocean. River running through Þingvellir National Park near the area where the world’s oldest parliament was established in 930. Öxarárfoss, a waterfall along the tectonic rift in Þingvellir National Park. The upper falls at Gullfoss, which translates to mean Golden Falls. Gullfoss is located along the famous Golden Circle route. Gullfoss is located in the canyon of the Hvítá river and plunges over a cavern that is105 ft. deep. The Strokkur geyser in the geothermally active valley of Haukadalur erupts every few minutes to heights anywhere between 15-40 meters high. Hot Spring at the geothermally active valley of Haukadalur. Taking a stroll with Inga from Tiny Iceland at Gunnuhver, a geothermal area in the Reykjanes peninsula. Camper van parked near Valahnúkur, a black sand beach in the Reykjanes peninsula. Ship resting in the field along the road in the Reykjanes peninsula. Plane in the field just off of Route 1. This barn looks as though it was engulfed by a lava flow many years ago. We spotted numerous houses like this along the coast. Beautiful and friendly Icelandic horses that came to say hi to us. Hvalsneskirkja is a church that was built out of stone in 1887. Pools near the entrance of the Blue Lagoon. Don’t try to swim here though, as the water is not warm like it is once you get inside to the actual lagoon. Pools of glacial water at the base of the Falljökull outlet glacier. Skógafoss is one of the largest waterfalls in Iceland and drops around 200 ft. off of a cliff. The famous Hallgrímskirkja Church and statue of Leif Ericson in downtown Reykjavík. The statue was a gift from the people of the United States to the people of Iceland. The Sun Voyager sculpture in Reykjavik is an ode to the sun. How to get a fresh drink of pure glacial water from a small stream. Our glacier hike guide, Magnus, pointing out some interesting facts. View from the start of our hike on the Falljökull outlet glacier. Our guide showing us how to walk on the glacial ice. Getting the ropes ready for ice climbing along the icefalls coming from the Vatnajökull ice cap. Looking out to the coast while standing on the icefall of the Falljökull outlet glacier. Our guide climbing up the icefall walls without any ropes. Working on setting up the second rope line along a steeper wall for even more ice climbing. Rappelling down the ice wall after climbing all the way to the top. It was hard to tell where the glacier stopped and the clouds started when we were hiking. Looking down into a water filled crevice on the glacier. Finishing up the remainder of our hike, our other guide, leading us in, out and around the crevices. LOVE these photos! We just back from two weeks in Iceland- what an incredible trip and country! We’ve started blogging our trip a bit but we are still working things up. It looks like you guys also had an amazing time! Wow, fabulous photos! What an amazing looking adventure! Thanks, Mary! We had a really great time! Excellent photos. Looks like you had great weather to photograph Hallgrímskirkja Church. I went and toured the south, but I want to go back to drive the entire Ring Road. Thank you! We did have great weather that day in Reykjavík, one of the few nice weather days of the trip 🙂 It was still amazing the other days though, even with the rain! I would love to drive the entire Ring Road as well–we decided we have to do that next time we visit! Hope you get to as well! Woah, rappelling down the ice looks EPIC! Amazing post! Thanks! Rappelling down the ice was sooo fun!! The glacier hike/ice climb was definitely our favorite activity of the trip! Ok, I think I need to open an Iceland specific savings account. It’s been high on my list for awhile but never seems to make the cut in the end (mostly due to expenses). These photos are so incredible… I’ve got to get there! Looks like you had a fantastic experience. AWESOME pictures! Now I want to visit. Hope you had a thick wetsuit for that snorkeling! I’m dying to go to Iceland, it looks like a photographers dream place to visit – so different and exotic than my world. I love all the nature, thanks for sharing this. Thanks! It is definitely a great spot for photographers, you would love it! It’s so beautiful! Sorry for the delayed response! I hope you are having a great time in Iceland already! We were there for 6 days in May. The rappelling was on a glacier hike/ice climbing tour. We did the Glacier Xtreme tour with Glacier Guides–it was one of the trips from Skaftafell. We would highly recommend it–it was so much fun!! Hope you get a chance to go and have a great trip–look forward to reading about it! WHOAAAA I need to get to ICELAND like yesterday! When I finally do book my trip, I want a detailed itinerary of EVERYTHING you guys did! 🙂 promise?! 🙂 And those photos are phenomenal! Gorgeous photos! I’ve been dreaming about visiting Iceland for years and finally made the trip last month. It’s taken me so long to go through all the photos I took (almost 1,000 in three days!) but I managed to blog a few of them. We visited several of the places you mention, although we didn’t have chance to go on a glacier hike. Looks like it was amazing! That’s a lot of photos in 3 days, wow! I can see how you could take that many though! I’m glad you enjoyed it too 🙂 The glacier hike was fun–we really enjoyed it. I will have to go check out more of your photos and posts from Iceland! Thankyou for sharing your amazing images of a place I can only dream about ever visiting – what a wonder travel blogging is! That water must have been so cold!! WOAW, what incredible photos. Each one looks more spectacular than the other. I guess you had a fantastic trip, eh? You make me want to hop on a plane, like right now! Thanks!! We did have a great time 🙂 We want to hope on a plane and head back too, lol! Absolutely amazing photos! The colours, composition and quality are stunning. How did you find Gullfoss waterfall? I was taken away by its might and power. Thanks so much! Really appreciate it! We enjoyed Gullfoss too–it was so pretty and powerful! Obviously I still want to go to Iceland myself, but I feel I don’t even need to after seeing this incredible photos, well done! Thanks so much! Really appreciate it 🙂 It was so pretty I feel like it’s hard to take a bad photo, haha! We loved it there though, such a beautiful place! Thank you–really appreciate it! 🙂 It was such a fun place; we had an amazing time and so many unique experiences. Hope you love it too when you get there! Just stunning! Iceland was the most beautiful place I’ve ever visited and I can see that there are so many more things to discover there. Snorkeling in Silfra at Þingvellir…. wow! Hope to be back soon, and the same for you. Wow, stunning stunning photos! I live in Minneapolis (saw you were from here) and went to Iceland with my dad two years ago, and fell in love with it. Amazing place! Great blog! Found it through the TBEX monthly challenge! Thank you so much and glad you stopped by to check us out! Always fun to run into fellow Minnesotans 🙂 Glad you enjoyed Iceland as well! Superb photos. I did Highway 1 around Iceland and the photos bring me back. 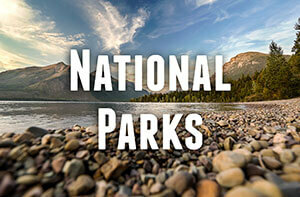 Its a great country with so much spectacular landscapes and scenery (that you capture so well). One of the best countries I was in. Every time I see photos from Iceland I struggle to believe this is actually planet earth… 🙂 Wonderful photo essay indeed! Thanks! We are always thinking the same thing–such a crazy landscape! 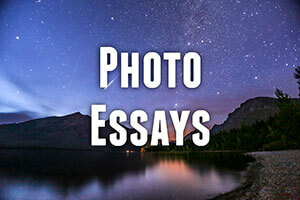 I really enjoy photo essays and these pictures are especially good! Iceland is beautiful but boy am I glad to not be in that cold! Wow! Amazing photos! This landscape looks fantastic! Thanks so much, Urska! It was so unique–we loved exploring all the crazy landscapes! Iceland is our favorite country! So excited to head back for the third time in September. Wow, third time?! That’s awesome! Hope you have a great time 🙂 It’s been our favorite country so far too–we are trying to plan a second trip out there–hopefully next spring we can make it back! Isn’t Iceland just amazing. I was just there in March and did a lot of the same things you guys have done. Looking at your photos I definitely wish I would have gone snorkeling and climbing/hiking on the ice. Those photos are just stunning. I am already planning my next trip back. Thank you! Really appreciate it 🙂 Isn’t Iceland such an amazing spot?! Glad to bring back some memories!! looks like you had an amazing time. Great photos. I read need another trip to Iceland as my last was not great! Oh no! What happened on your last trip? We loved Iceland and had a wonderful time–I hope you get to go back and enjoy it one day!